Orbital movement of the Earth causes the gradual and predictable travel of a shadow across the face of a sundial. Each sundial must be designed for an exact location, otherwise it will only reveal the dialer's ignorance (Figure 1). Adaptation to a precise location is a good principle in all garden design. The length of the shadow cast by a sundial's gnomon depends on the time of year, the latitude of the dial, and the position of the earth on its daily rotation. No two identical dials, in different gardens, will cast shadows in the same position at the same time. Sunlight itself is produced by the conversion of hydrogen to helium and takes 8 minutes to travel the 149.6 million kilometers from sun to earth. It is little wonder that dials induce contemplation. They were placed on church towers, because "time is a sacred thing'. When mechanical clocks became available, the demand for dials increased: they were needed to set the clocks. 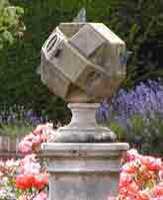 When other ways of setting clocks became available, many old dials were moved into vicarage gardens. The great Creator, who made the sun to rule the day and the moon and the stars to govern the night, has adapted our nature to these intermitting changes, and implanted in us an immediate desire to count how, drop by drop, or grain by grain, time and life are passing away. HORA FUGIT, MORS VENIT: Time passes, death advances. FERT OMNIA AETAS: Time bears all away. DOCET UMBRA: The shadow teaches. MANEO NEMINI: I wait for no one. MEMENTO FINIS: Remember the end. SIC TRANSIT GLORIA MUNDIS: So passes the glory of the world. SOL NON OCCIDAT SUPER IRACUNDIAM VESTRAM: Let not the sun go down upon your wrath. But we waste time, so time and we are quits. What is the time? come, why do you ask? Is it to start, or to end your task? Love of riddles and puns has touched the sundial. WE SHALL ____ is proclaimed by a number of dials. Should the possessor of a lively mind pass by, the words "dial' or "die all' will come to her. SOL ME VOS UMBRA REGIT: The sun guides me, the shadow you. SENESCIS ASPICIENDO: Thou growest older whilst thou lookest. REDIBO, TO NUNQUAM: I shall return, thou never. I AM A SHADOW, SO ART THOU. I MARK TIME, DOST THOU? HORAS NON NUMERO NISI SERENAS: I count the bright hours only. It has been noted that the last motto in the list is "either totally useless or utterly false'. FUGIT HORA, ORA: The hour flies, pray. IN THE TWILIGHT OF HIS DAYS, TEACH THE FREEMAN HOW TO PRAISE. Clocks measure Mean Time, which is averaged to produce hours and days of equal length. Sundials measure solar time, which is equal to clock time only four times a year, on 16 April, 14 June, 2 September and 25 December, with slight adjustments for leap years. In between these dates, solar time will be up to 16 minutes before clock time or 14 minutes after. This is because the Earth follows an elliptical orbit and moves faster as it nears the sun. When the earth moves faster, solar time is ahead of clock time. To me, this is a fact worth knowing. Garden dials should be calibrated to reveal astronomical information. When slowing down, towards the end of a day's gardening, I would like to know whether the Earth is accelerating or decelerating. An adjustment table on the dial face would facilitate conversions from solar time to clock time. Because clocks are also adjusted for Standard Time Zones and perhaps for Daylight Saving Time, they do not often tell the true noon. I like to know when the sun has reached its zenith and the garden is at its brightest on a particular day. A noon mark is the simplest way of telling the sun's zenith. It can be a straight line on a level surface, along which the shadow of a vertical pole falls at noon. Such marks were once drawn on window sills, to catch the shadow of a glazing bar. They were also placed on level lawns, utilizing the shadow of a flag pole. A noon line could be an awesome starting point for a garden layout. It can be marked by recording the shadow of a plumb-line at the instant of local noon, or by using a compass and making an adjustment to find true north. If a horizontal pole with a small plate at the end is fixed to a vertical wall, it can mark the local noon and be read from a distance.